Features: Dimensions: 24 x 37 x 11 inches Fabric: Water resistent denier polyester with reflective side trim. Extras: Handle and shoulder strap included. 4 pockets. 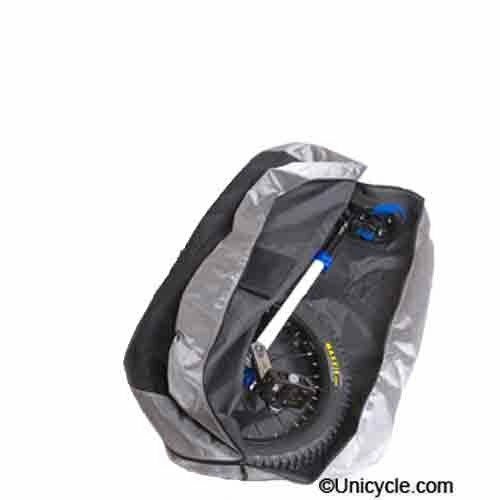 Will hold: -Two 20" unicycles intact w/o pedals -One 24" unicycle with a 200mm seatpost and saddle, no pedals -One 26" unicycle without saddle or seatpost or pedals -One 29" unicycle without saddle or seatpost or pedals This is not considered an oversized bag to the airline, however checking with your preferred airline is always recommended.